Earlier this week I received a note about an upcoming auction that looks like it could be kind of fun for Maple Leaf enthusiasts. I had assumed most of the old Maple Leaf Gardens stuff had already been sold via various earlier auctions, but apparently some pretty neat items are still available from the golden years of Maple Leaf hockey. A side note...in visiting the Frozen Pond site, I noted that they have some autograph signing sessions scheduled with two legendary former Leafs, Johnny Bower and "Senator" Frank Mahovlich over the next while. 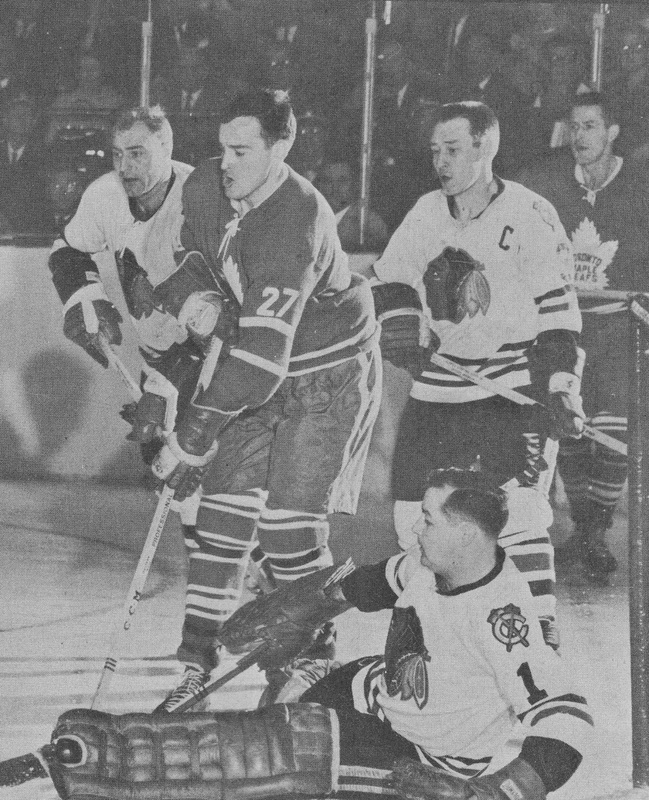 The "Big M" (seen at right, in action against the Blackhawks in the early 1960s, sandwiched between "Moose" Vasko and fellow future Hall-of-Famers Pierre Pilote and Glenn Hall) might have been the most under-appreciated star in Leaf history until Phil Kessel arrived. The hallways at the Gardens were treasure trove of memories. There weren't just pictures of all-time greats, there were shots of lesser-known individuals who had played over the years for the blue and white. All the images captured what it was to be a Maple Leaf in the ‘40s, ‘50s and ‘60s - and even later than that. Normally I don’t promote these things but given that we are without NHL hockey and will be for some time, I thought this might be a unique opportunity for those who love Maple Leaf history. I have so many fond memories about the old Gardens, including the fact that I was, for a brief period of time, a "season-ticket" holder (although probably the one with the least amount of money ever) and also a member of the Hot Stove League, despite the fact that I was a poor university student. Those are warm memories for me. In any event, there is a “preview” of the articles that will be available at the old Gardens (now the Mattamy Athletic Center) at Church and Carlton in Toronto. The exhibit will evidently be on display on October 11 at one o'clock in the afternoon. The online auction itself begins that same day and runs until November 14. Let me know if you win anything! I have sworn off any NHL purchases until the strike is settled...and that includes souvenirs and memorabilia. This is my little fan protest. When it arrives, I think I will have the snappiest lunch box on the entire bus. I have fond memories of browsing the many wonderful black and white photos gracing the corridor walls of the main floor of Maple Leaf Gardens. When I was a youngster, photographs were the only visual representations of hockey and the Leafs that we had. My ritual was to spread the paper (Globe and Mail in the morning, Telegram in the evening) on the living room rug open to the sports section, drinking in the stories and the wonderful photographs. We were blessed in Toronto to have great photographers such as Nat and Lou Turofsky. Nat Turofsky's photograph of Bill Barilko's Stanley Cup winning goal (against Al McNeil with Rocket Richard looking on) remains the classic Leaf photograph of all time. There were many fine photographs on the Garden walls. Pictures of Turk Broda in full stretch, Teeder Kennedy with the Stanley Cup, Max Bentley and Syl Apps stand out in my memory. I will definitely be in on the bidding. Thanks DP- I understand your "protest"- some of us won't be as strong! Browsing is the right word, PeteCam. I did the same, and don't regret a second of the time I spent looking at photographs of old-time Leafs - and other memorable and lesser-known NHL'ers - in the corridors of Maple Leaf Gardens. While it's not family or about other important life issues, tucked in that small corner of my mind, the lMaple Leaf legacy still means the world to me- and those photos (and memories) are a huge part of it. By the way, I think that is Billy "Hinky" Harris in the background of the photo. That would put it timewise at the time of the HEM line (Harris, Ehman and Mahovlich). I think you're right PeteCam. Harris was a slick center, very smart and a fine puck-handler. 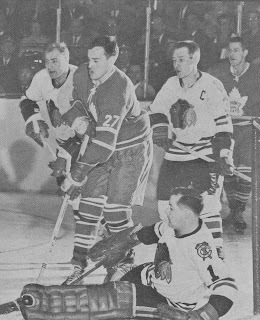 Ehman was another of those old-time Leafs, an under-the-radar guy but a real grinder. Gerry Ehman, wearing number 17, was one of my favorite players during that time, a two way right winger with a very accurate wrist shot. His game provided a great complement to the skills of Mahovlich and Harris.